The word 'Bhuna' means to saute or to fry. Bhuna is a cooking process, where the ingredients are added to the pan or kadai and fried in oil without adding any water. Bhuna gosht is a popular Indian recipe where mutton(I used goat meat) is slow cooked along with various spices. The meat cooks in its own juices which give a different dimension to the meat's texture and a deep flavor to the gravy. This kind of cooking takes much longer time compared to pressure cooking but its worth it as the end result is outstanding. 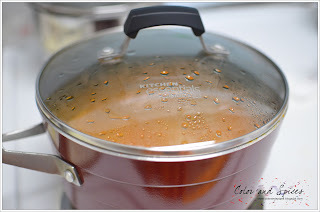 From my own experience I can tell you, once you try your hands on slow-cooking you will love it and will promise yourself to stick to slow-cooking as much as possible. 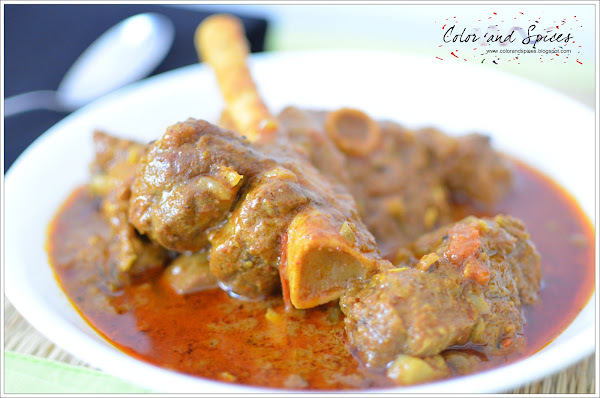 In bhuna gosht loads of onions are added along with the meat, which gradually caramalises to give a thick brown gravy. You can use any meat(lamb/beef/goat) to make this . The meat should be of good quality and make sure to use large pieces of the meat. Use few pieces with little fat on it, that will give nice glaze to the dish. Some like to reduce all the juices and makes a very dry dish, but I prefer to have thick brown rich gravy, so I can dip my nan bread into it or mix it with my khushka biryani and enjoy it. 1. Wash and clean the meat. I used the front leg(agli raan) part of the goat. You can use a mix of leg and rib portion. 2.In a heavy bottom non stick pan add ghee and vegetable oil. You can also use only ghee. I used ghee and oil in 1:1 ratio. When the oil is hot, add the onions. 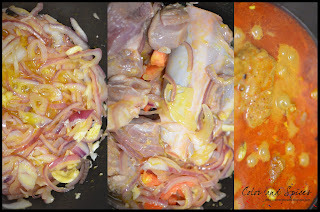 When the onions are transparent, add the meat, tomato and ginger-garlic paste. Cook in high heat and keep stirring. As the meat starts changing color, add corriander powder, kashmiri red chili, turmeric powder. Mix well. Cook for 3-4 min in high heat. 3.Bit the yogurt with 1/2tsp sugar and 1/2cup water. Bit it well, there should be no lumps. Reduce heat to medium. Add the yogurt to the meat. Add salt. Mix well. 5. As the meat is cooking dry roast the spices shah jeera, cradamom, black cardamom, cinnamon, cloves, black peppercorn, dry red chili(optional) and grind to a coarse powder. As oil separates from the masalas add this freshly made spice powder. 6. 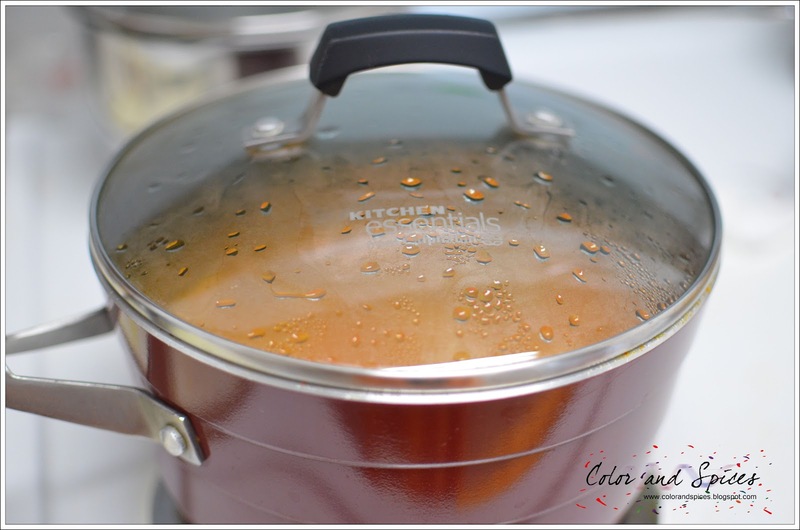 If you want it to be completely dry then uncover the pan and keep cooking till the juices dry up. But I prefered to have a little gravy on my bhuna gosht. I had my bhuna gosht along with aromatic khushka biryani and green salad. The slow cooking is the best...it gives such a flavor and texture. 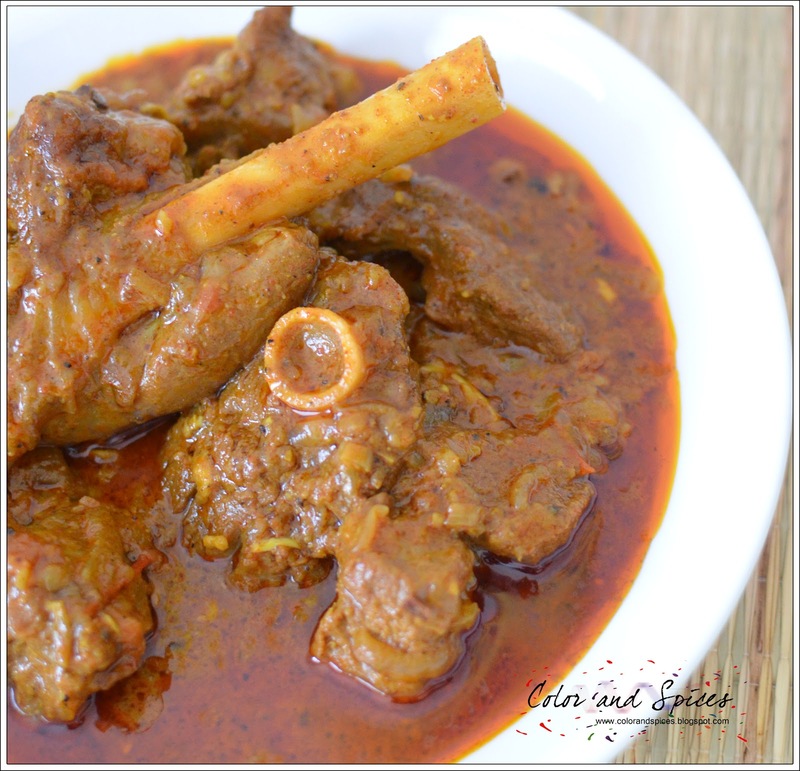 hi i want to make this again but would like to know that can i marinate the mutton and the spices used for the masala AND dahi, or boil the mutton half and marinate the same, pls help and i want to make this today evening. Sunita, This is a braised meat recipe, so technically you need to cook the meat along with the masala, specially with the sliced onions. But if you are in hurry then you can always improvise according to your need. Arka, If you are using 500 gm of meat then 250-300 gm of onion is right amount. Hello Smita, yes you can use ready made Garam Masala powder to save time but homemade powder will bring more taste to the dish.